I baked scones for breakfast but with a slight twist on my regular scone recipe. Brown sugar was substituted for the white and a splash or two of maple syrup was added in with the cream. Finished with a maple syrup glaze. with fork until mixture forms a dough. Using hands gently pat the ingredients together. Fold over once or twice or even three times if necessary. Do not over-handle. Tip: An easy way to cut in the butter is to use a box grater. The large side of the grater makes the perfect size pieces of butter. Ann, these sounds super yummy! 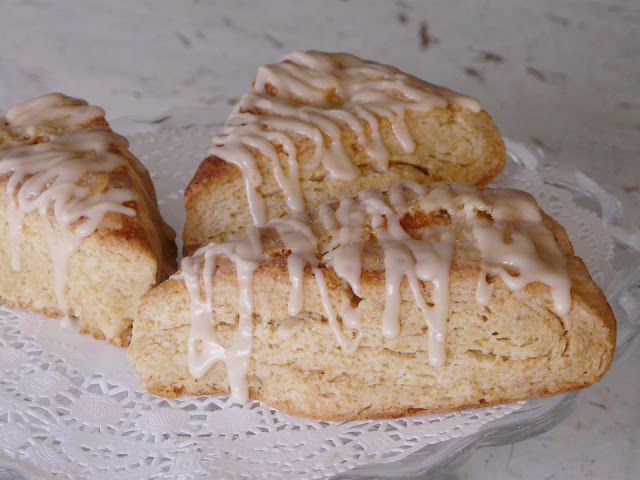 I LOVE scones and these look scrumptious! Oh my gosh! I just noticed the tart on your sidebar! I just made one last night for today's book club meeting that looks almost identical (yours is prettier- I was falling asleep!). I must check that out! I just love scones!! These sound lovely!! They look fantastic! I have only made scones once and they were a disaster. There was no liquid in the recipe and I imagine that's why they were so bad. This recipe sounds like a keeper that I will try! Thanks! I keep forgetting about box graters! Duh. I use my food processor, in pulse mode of course. I'm having a scone craving lately. These looks dee-lish. These look fantastic! I just love a good scone! Oh I must try these! I love maple...give me a maple bar or maple candy and I am a happy camper. I know that I will love the scones!! Thank you for sharing. 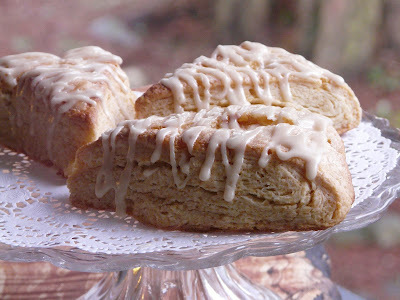 I just love maple in anything... what a great scone recipe...thanks! These look wonderful Ann...I must give them a try! These look fantastic, I love the addition of the maple syrup drizzle on top, thanks for posting! LUUUUVRE the idea of maple! With maple syrup season here, this would be perfect! 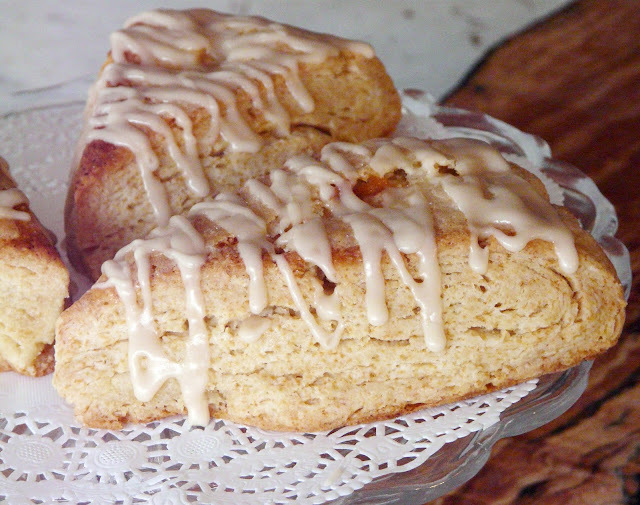 Can anything be substituted for the heavy cream and still make a good scone? Thank you. You can use just milk, buttermilk, or a combination of milk and yogurt. It will all make a good scone. I just like the richness of the cream.